What better way to explore the UNESCO-listed paradise of Fraser Island than on a Jet Ski? Ride solo or with a friend and zip past white sand beaches, shimmering coastal lagoons and lush rainforest, with a chance to spot sea turtles, dolphins and dugongs. Choose from a 1.5-, 2.5- or 4-hour guided tour, taking in highlights like Great Sandy Strait and Moon Point, or stopping to swim or snorkel at Pelican Banks. Best of all – full instruction and all equipment is included, so even beginners can join in the fun. 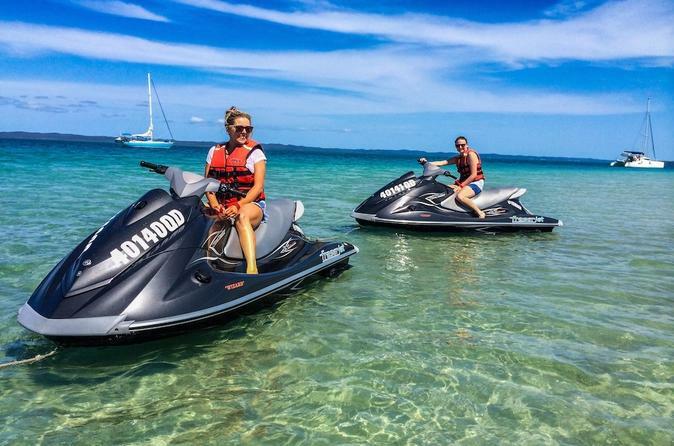 Access hard-to-reach locations along the coast of Fraser Island on this fun jet ski excursion.